1. Exclusivity: The Photographer shall be the exclusive photographer retained by the Client for the purpose of photographing the event. Guests, Family and friends of the Client shall be permitted to photograph as long as they shall not interfere with the Photographer’s duties. 2. Payment: When a retainer is required, the Photographer will not reserve a date and time until the retainer and a signed contract is received by the Photographer. Client shall make a deposit in the amount of five-hundred dollars ($500.00) to retain the Photographer to perform wedding photography services and/or one-hundred dollars ($100.00) for portrait and engagement photography services specified herein. At such time as this order is completed, the deposit shall be applied to reduce the total cost and Client shall pay the balance due. Balance can be paid in advance, but is due in full the day of the event for the service to be provided. The initial deposit will be non-refundable and will serve as a cancellation fee. After delivery of services, no digital files, albums or products will be delivered unless full payment has been made. Payments using credit cards will incur an additional 3% charge. 3. Copyright and Reproductions: The photographer retains all intellectual property rights, including copyrights, to the images. The photographer has the exclusive right to make reproductions and reserves the right to make reproductions his portfolio, samples, self-promotions, entry in photographic contests, wedding or art exhibitions, editorial use, advertisements, website, social media or for any other marketing or use he chooses. 4. Client’s Usage: The Client is obtaining prints for personal use only, and shall not sell said prints. If Client is obtaining a print for newspaper announcement of the wedding, editorial use or website, Photographer authorizes Client to reproduce the print in this manner. In such event, Client shall run a credit for the Photographer adjacent to the photograph. 5. Limit of Liability: In the unlikely event that Derek Halkett Photography is unable to perform to the guidelines of this contract due to an injury, illness, act of God, act of terrorism, or other cause beyond the control of Derek Halkett Photography, we will make every effort to secure a replacement. If the situation should occur and a suitable replacement is not found, responsibility and liability is limited to the return of all payments received for the portrait session or wedding. In the unlikely event that digital files have been lost, stolen, or destroyed for reasons beyond Derek Halkett Photography’s control, including but not limited to camera, hard drive, or equipment malfunction, Derek Halkett Photography’s liability is limited to the return of all payments received for the photography event. 6. Responsibilities: Derek Halkett Photography is not responsible for compromised coverage due to causes beyond the control of the photographer including but not limited to obtrusive guests, lateness of the client, guests or other wedding professionals, weather conditions, schedule complications, incorrect addresses provided to the Derek Halkett Photography, rendering of decorations, or restrictions of the locations. 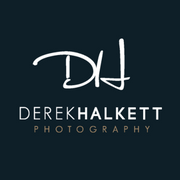 Derek Halkett Photography is not responsible for backgrounds or lighting conditions which may negatively impact or restrict the photo coverage. 7. Shooting Time/Additions: The client and photographer agree that cooperation and punctuality are essential to accomplish the goals and wishes of all parties. Shooting commences at the scheduled start time and ends at the scheduled end time. If the client does not arrive on time the photographer is not responsible for lost photography time or additional cost incurred, should the session extend past the end time. I require at least one hour of dedicated photography time during a wedding for formal photographs of the bride and groom, bridal party and family. If other factors outside of the control of the photographer cause delay or impact negatively on this time frame, the photographer is not responsible for lost photography time or photos on the formal photo checklist. 8. Expenses Incurred: When applicable, the client is responsible for all travel, accommodation, meal and transportation costs unless provided by the client. Travel is included for all weddings within sixty miles of Knoxville, Tennessee. Each additional mile is billed at a rate of $.60 per mile. A $200 travel fee will be assessed to all New England Weddings. A 3% Licensing fee will be assessed to all weddings & Engagements in the Great Smoky Mountain National Park. 9. Venue and Location Limitations: Derek Halkett Photography is limited by the ruled and guidelines of the location(s) and site management. The client agrees to accept the technical results of their imposition on Derek Halkett Photography. Negotiation with the officials for moderation of guidelines is the client’s responsibility; Derek Halkett Photography will offer technical recommendations only. 10. Cooperation: The Client will assist and cooperate with the Photographer in gaining the requested photographs, such as specifying the people and location to be photographed; assisting the Photographer in posing at the Photographer's direction; pre-session consultations, etc. The Photographer is not responsible for photographs that are not taken due to the Client's failure to be cooperative or be of reasonable assistance. 11. Miscellany. This Agreement incorporates the entire understanding of the parties. Any modifications of this Agreement must be in writing and signed by both parties.